Here is another recipe from Kraft Foods. I am not a seafood eater AT ALL but I figured most of you are so I better share some seafood recipes for you. Here ya go! -PLACE fish on rack of broiler pan. Spread with mayo; top with Parmesan. -BROIL, 6 inches from heat, 6 to 8 min. or until fish flakes easily with fork. -MEANWHILE, prepare stuffing as directed on package and cook green beans. Serve fish with stuffing, beans, lemon wedges and rolls. Heat oven to 475°F. Line baking pan with foil; spray with cooking spray. Place fish in pan; top as directed. Bake 5 to 7 min. or until fish flakes easily with fork. Sprinkle with paprika, if desired. 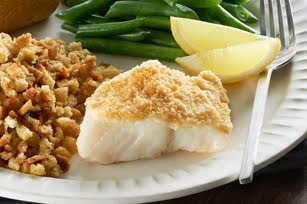 Prepare using any mild-flavored white fish, such as tilapia, grouper, haddock, sole or halibut. This recipe looks great! I am also not a seafood eater but we had some people over for dinner that only eat fish and I made a Tilapia recipe...sort of similar to this one and I substituted the Tilapia w/ chicken for the kids and myself...and it actually came out really well...just an idea for others who thinks a recipe looks good but don't like fish.